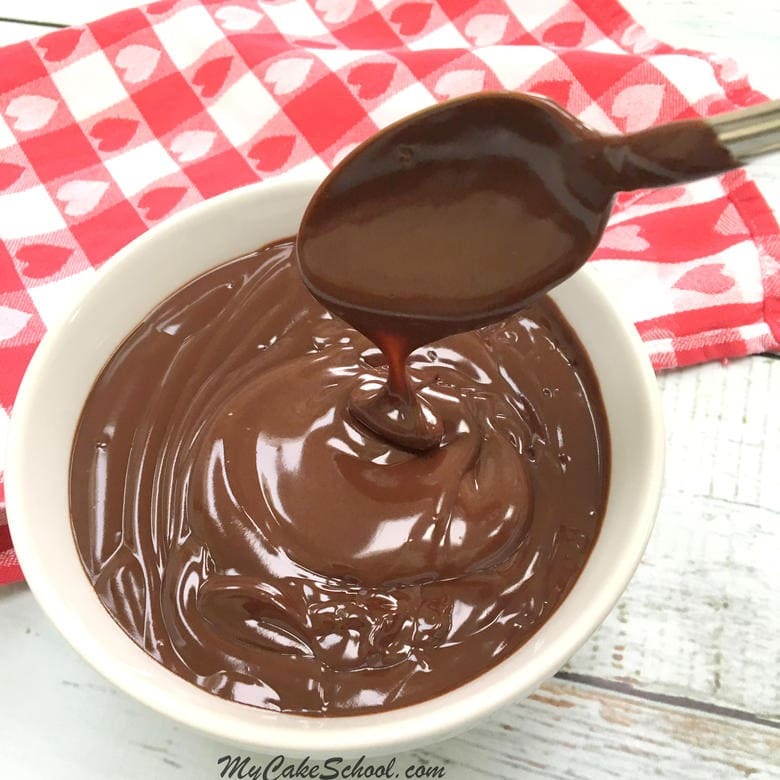 Today I’m sharing a super easy, fabulously delicious two-ingredient ganache drip recipe which not only can be prepared in the microwave, but can also be whipped for cake and cupcake fillings or swirled onto cupcakes. Ganache sounds so sophisticated and fancy, doesn’t it? Before I became a “cake lady”, I never would have guessed how simple it is to make. 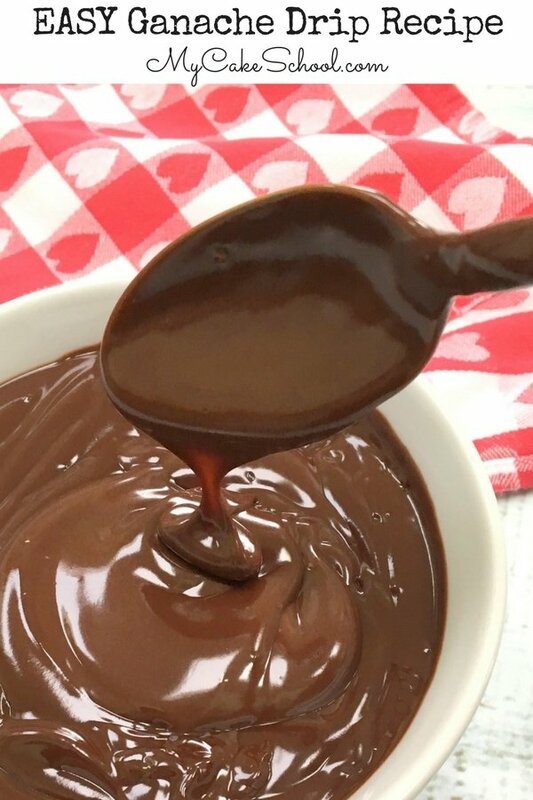 Really, this ganache drip recipe has just two ingredients! Beautiful drip cakes continue to be hugely popular and thankfully, this cake trend is surprisingly easy to achieve no matter what your level of cake decorating! 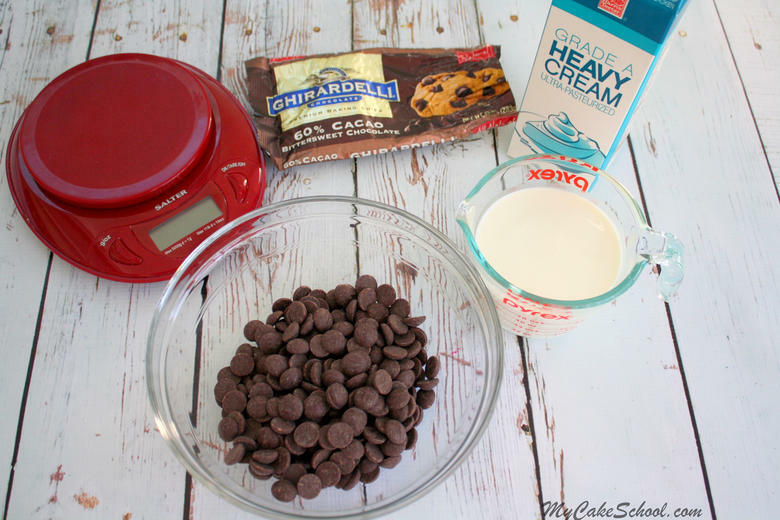 The two ingredients that we’re working with are heavy cream and dark chocolate. Since we are making a glaze suitable for a beautiful decorative drip, I’m going with a 1:1 ratio of chocolate to cream. This will give us an easily pourable (and drip-able) consistency. If we needed a thicker, more spreadable ganache frosting that will set up firm (often used beneath fondant), I would use a 2:1 ratio of chocolate to cream for a semi-sweet or dark chocolate ganache. Here’s our Video of How to Make an Easy Ganache Drip and Whipped Ganache in the Microwave (And how to apply it)! Note that White Chocolate and Milk Chocolate play by different rules! Here are our key players: heavy cream, chocolate, and a scale. You’ll want equal amounts of chocolate and cream by weight. ***Note that in my video above, we used semi-sweet chocolate, which also works well. If you only need enough ganache to cover the top of a cake plus a ganache drip, you could get away with using 8 oz. of chocolate to 8 oz cream, but I’m always happy to have a little leftover! 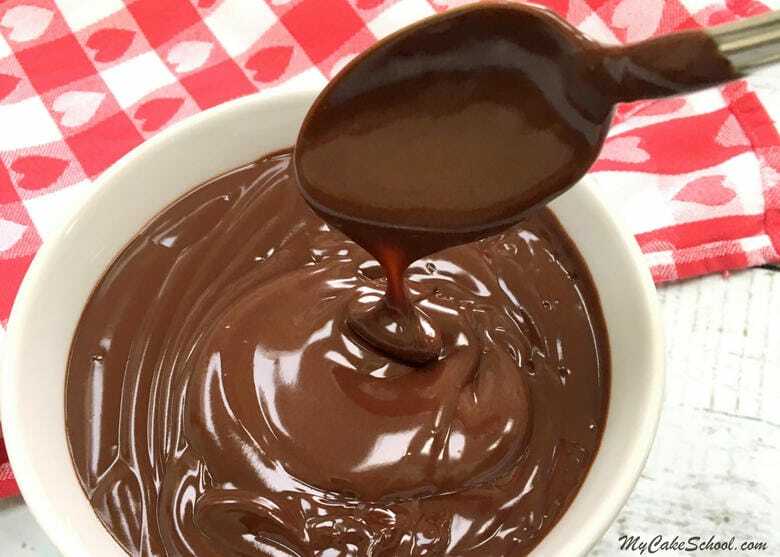 My favorite way to make this simple ganache is in the microwave. 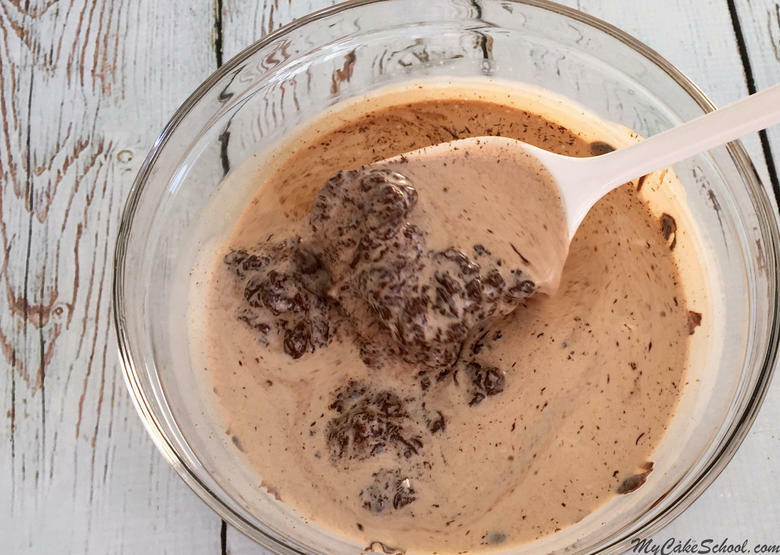 Simply pour the cream over a bowl of your chocolate, and microwave for about 1 minute. *We used 10 oz chocolate and 10 oz cream. If you are using smaller amounts, you will not need to microwave this long. Sometimes we go with 12 oz chocolate, 12 oz cream as in our video. The important thing is the 1:1 ratio. Give it a stir. It’s getting melty but still needs more time! After 30 more seconds in the microwave, the chocolate pieces had almost melted. I allowed it to sit for a minute before stirring so that it could melt a bit more. I always try to stir by keeping my spoon beneath the surface of the ganache so that I won’t create too many air bubbles. Almost ready! Just needs a bit more stirring. 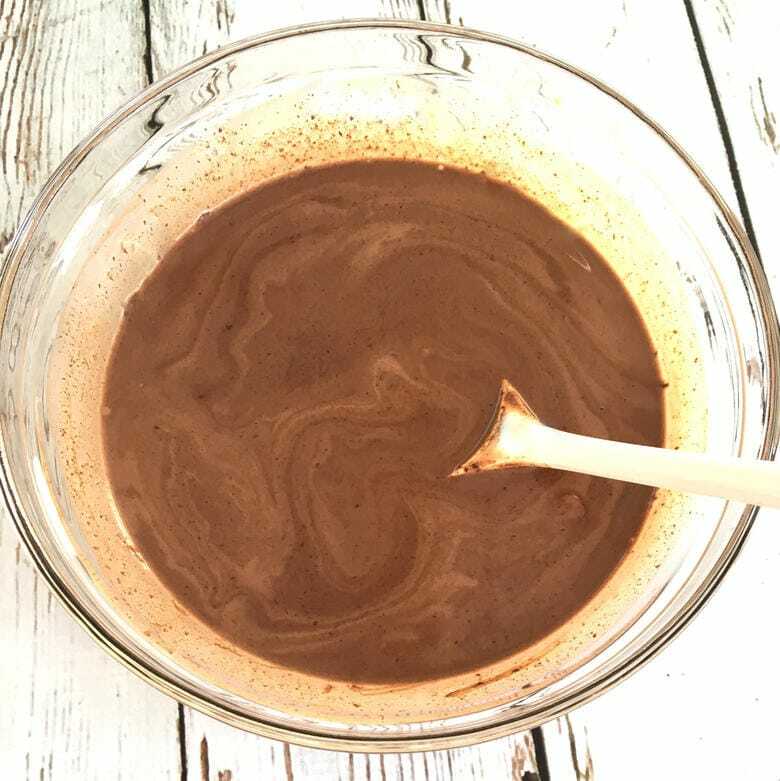 Before you know it, with a bit of stirring the cream and chocolate mixture will suddenly transform into a luscious, silky smooth ganache! The consistency is perfect for a ganache drip while just barely warm, and it is also perfect for glazing cupcakes. As it sits, it will set up a bit and begin to thicken but will remain soft. If it cools off and becomes too thick before you have a chance to decorate your cake, simply reheat the ganache in small increments until it’s reached the desired consistency. When the consistency of the ganache has begun to thicken slightly (it doesn’t take long), I like to use my spoon to dot a few drips on the inside edge of my ganache bowl to see if they quickly run all the way down, or if they stop midway down. This will give you an indication of what will happen when you apply your drips to the cake. If the ganache runs quickly from top to bottom of the inside of your ganache bowl, it needs to cool a little longer. If the ganache barely moves, or comes out extra thick, it has cooled too much and needs to be reheated slightly. We hope that you enjoy this sinfully delicious, EASY ganache! It’s always a crowd pleaser and is so beautiful when dripped and drizzled over cakes and cupcakes. Nobody has to know how easy it is to make, it’ll be our little secret! In the photo below, I’ve filled a disposable piping bag with our ganache and snipped the tip away so that the drip can easily be piped. If the ganache drip is warm, it should flow easily and fairly quickly. Apply slight pressure to create long drips as you work your way around the cake. A cake turntable is optional, but helpful for rotating the cake as you work. This ganache drip recipe also be transformed into a delightful whipped ganache! 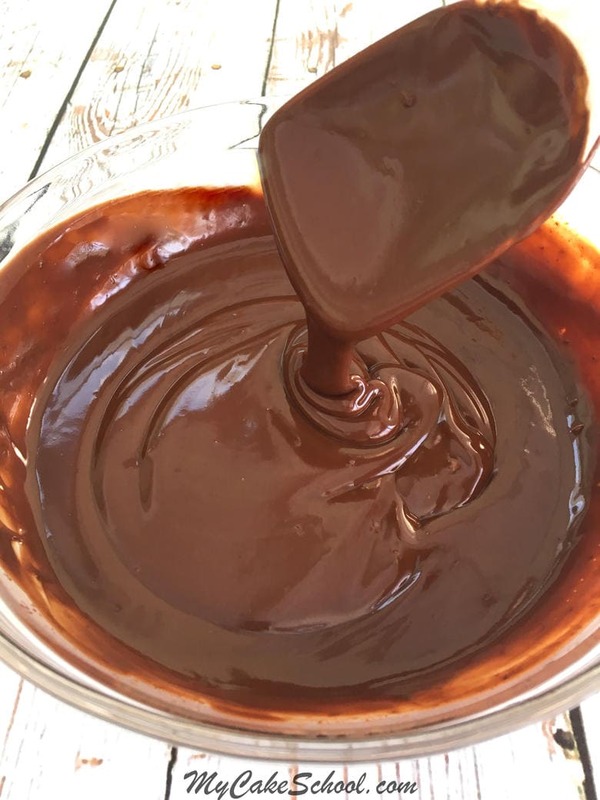 To do this, allow the ganache to set up at room temperature for about 2-3 hours or until it has thickened to a good frosting consistency (some describe it as a peanut-butter consistency). Then, whip with a hand mixer until it fluffs up– sometimes this can take as little as 30 seconds. Do not over beat your ganache or it could split or break, giving it a very grainy consistency. 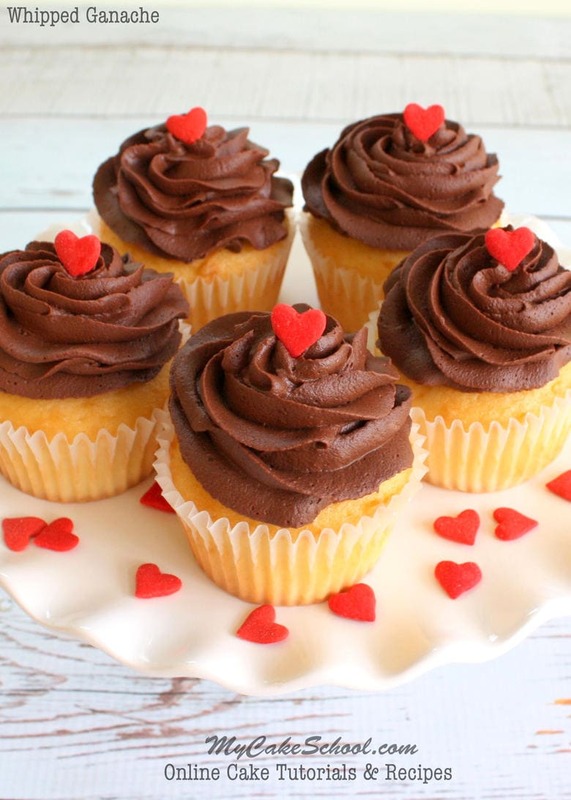 Whipped ganache makes a wonderful filling for cakes and cupcakes, and also for frosting cupcakes with swirls! These were piped with a 1M tip (a 2D tip works well too.) This whipped ganache is not an ideal consistency for frosting over an entire cake, but it is great for a little decorative piping or swirling onto cupcakes. Finally, here’s our Ganache Drip in action! We created a quick minute-video when we decorated our DELICIOUS Mint Chocolate Chip Cake so that you could see how easily a ganache drip can be applied to a cake by just loading it into a piping bag, snipping away the tip, and giving it a whirl on the turntable! Oh the drama! 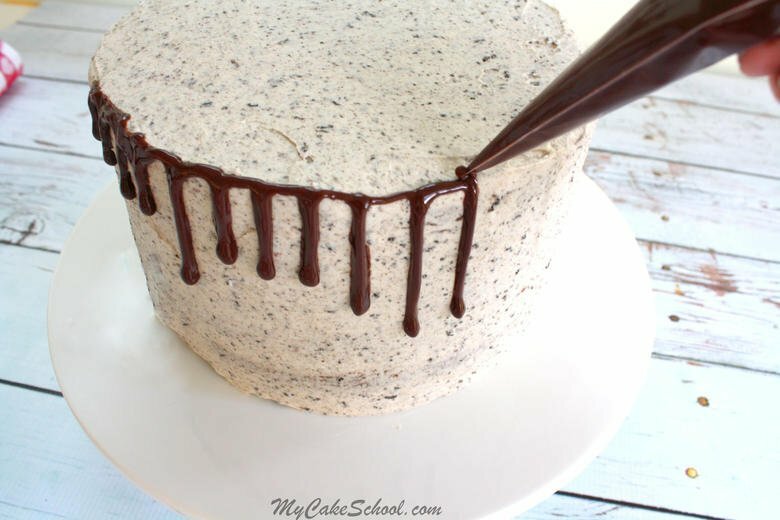 This decadent and dramatic ganache drip recipe is SO easy to make! We love to add it to our cakes for an added wow factor (plus, it's delicious)! I load my ganache into a disposable piping bag and snip the end away (start with a small hole, you can always make it larger). Thanks for stopping by! Don’t forget to check out our full collection of FAVORITE cake and frosting recipes in our Recipes Section! As well as our ever-growing collection of free cake decorating tutorials in our Free Cake Tutorials Section! And finally, if you LOVE cake decorating and would like to have full access to our entire cake decorating video section, you should consider becoming a member of My Cake School! You can find all of the details here: My Cake School Membership Information. We’d love to have you!! Excellent article, thank you for sharing it. Can I add sugar powder for thickening ganache? Hi Panna, You probably won’t need to add powdered sugar. When ganache is first made it is pourable. 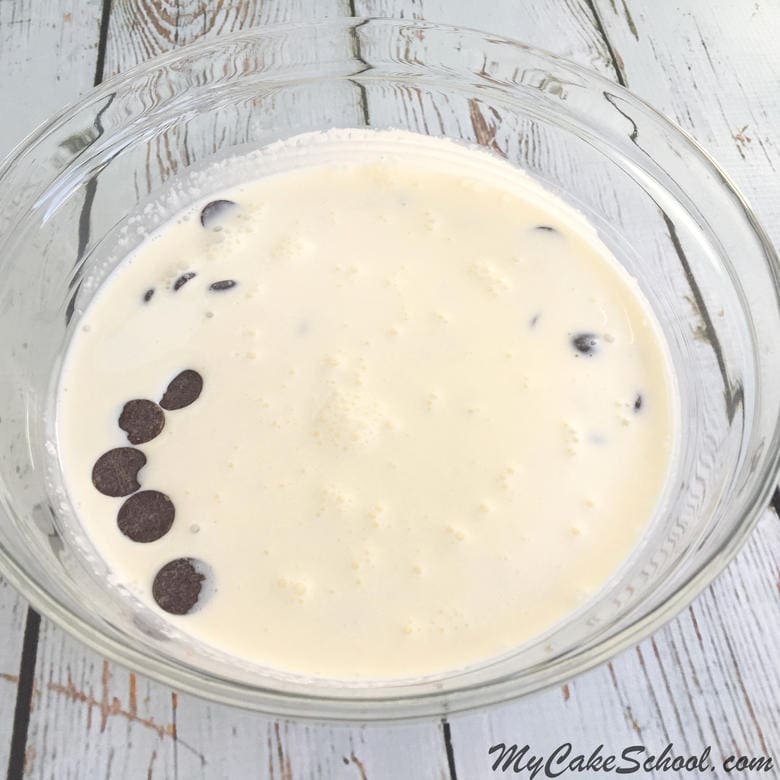 As it cools to room temperature it begins to thicken, at this time you can whip it with your mixed and it will lighten in color and become fluffy. If you want to add powdered sugar. Allow ganache to cool about 2 hours. Sift the powdered sugar before adding. The powdered sugar will add sweetness to the ganache and lighten the color. Hi Sukayna, I’m glad all went well. Yes, you can freeze ganache. Make sure it is in a container that is airtight so it will not absorb other odors from the freezer. I think it can be frozen for a long time, 10 to 12 months. Let it thaw slowly to room temperature when ready to use again.